And then a few seconds later, “We’ve lost another engine. 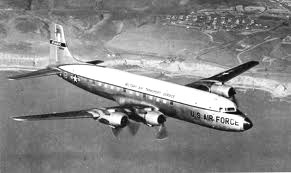 For hours, the crew of an Air Force C-118 Globe Master were the only eyes and ears for the rescue effort following the ditching of Flying Tiger 923. But after nearly 5 hours and running low on fuel, the AF plane was forced to return back to Scotland. By that time other aircraft circled the area, helping to mark the location of the lone life raft carrying 51 bodies, three of which were dead upon arrival at the rescue point. As the aircraft headed back to Scotland, the crew could see a rescue ship on its way, no more than 40 miles out. Captain Joseph K. Lewis, 25, of Tuscaloosa, Alabama was the pilot of the C-118. He was taking American military personnel from Prestwich, Scotland, to Harmon, New Foundland, and then to the U.S. when he heard the distress message. He was captaining for the first time. He got Capt. Murray’s call that he was ditching and abandoned his mission to provide help to the failing Flying Tiger. Captain Lewis came into position behind the Flying Tiger about 10 minutes later. His view was blocked as he descended through a cloudbank. He asked the Constellation‘s pilot, Captain John Murray, for his altitude. He didn’t get an answer to that question. Instead he heard the terrifying news. For a few long seconds, the C-118 lost sight of the crippled Tiger completely as it sank into a low cloud. Then it was dark. Finally, after making two unsuccessful passes circling the area and seeing nothing, on the third pass the crew saw a light flashing from the raft below, the only light, the one single emergency flashlight. The life raft, packed with bodies, was floating upside down and the emergency lighting along its rim was facing into the pitch-black water. For the next five hours, Lt. Michael J. Burnett, the C-118’s co-pilot, was in charge of all communications between his ship and all other planes and ships alerted to the crash. Lt. Burnett, of Vinson, Oklahoma, was considered for that time as the eyes, ears and voice of the tracking team. The Air Force ship circled the scene, directing search and rescue aircraft to the survivors and dropping brilliant flairs to light up the sea and bringing hope to the survivors in the life raft below. The efforts of the crew that night were considered so heroic that only a week later, on Sept. 30, 1962, that same crew were invited to New York City to be on the nationally transmitted Sunday night Ed Sullivan TV show. In their dress uniforms, they were all introduced by Mr. Sullivan, and stood as a team for a bow to rousing applause. Their part in the rescue was reported extensively in the London Times. This entry was posted in rescue teams. Bookmark the permalink. Joe Lewis was my cousin and I am very impressed with this article and the work that has gone into. Joe’s wife, Lou, provided me with the website. One of her granddaughters found it somehow and sent it to her. I still remember watching the Ed Sullivan show when they had him on it. Thank you for the memories.